The list of foods that have changed my life is not a short one. I don’t have a favorite food because I love so many foods too damn much. I’d be nothing without avocado. Hummus is my homeboy. Dark chocolate gives me life. My daily smoothie bowl is quite possibly my favorite thing I eat all day, which is saying a lot since I eat it every single day and any normal chickpea would grow sick of it. I adore it because a) it tastes like a chocolate milkshake b) is super fun to eat and c) is packed with oodles and oodles of fabulous nutrients to power me through my day. At the end of the day, making smoothies isn’t that hard. They don’t take that long. But there’s a lazy devil that lives inside it all saying “ehhh, taking the blueberries out of the freezer sounds a bit too laborious for my liking. I’ll just grab a bar instead.” This is precisely why the make-ahead smoothie bags were birthed. They are life-changing. They will CHANGE.YOUR.LIFE. You likely wake up pretty snoozy, ready to swan dive into a cup of joe. Believe me when I say you will jump for joy when you realize that your smoothie is already pretty much made for you. All you have to do is add your liquid of choice (I always go for unsweetened vanilla almond milk and some water) and any wet, non-freezable add-ins like nut butter, yogurt, dates, or avocado. Ninety nine percent of the work is done for you and that my friends, is so dreamy. Now you can put whatever your heart desires in your smoothie packs based on your personal tastes; but let’s a take a hot second to chat about my favorites and why these go-to smoothie ingredients are so good for you! Frozen blueberries: Blueberries are loaded with fiber and anti-aging antioxidants. Wild Blueberries are even better, with double the antioxidant content. Studies suggest that the antioxidant capacity in blueberries helps delay cognitive decline, inhibit cancer growth, lower blood pressure, and fight depression. They’re also lower in sugar than most other fruits. Win! Frozen spinach: Go for the flat-leaf kind in the bag, not the solid box. Spinach is on the dirty dozen list, so try to buy organic. Going for frozen a) gives the smoothie a thicker, creamier texture and b) saves money! Spinach is low in calories and high in vitamin A, K, and C. Go greens! Raw cacao powder: My love for cacao stems from my overall chocolate obsession, but I got hooked on it a few years ago. Cacao (pronounced cah-cow) is an ancient Aztec superfood that’s rich in mood-boosting bioflavanoids and theobormine, a bioactive compound that helps improve blood flow. That may explain why chocolate is also known for its aphrodisiac properties (but let’s keep it PG here, friends.) Cacao is also jam packed with magnesium, iron, and of course, antioxidants. I also always sprinkle the top of my smoothie with cacao nibs for added crunch, not to mention flavor, fiber, and you guessed it—MORE antioxidants! I wouldn’t say that the cacao adds an overwhelming chocolate flavor, either. Hemp seeds: Hulled hemp seeds are the highest protein seed (higher than both chia and flax and lower in carbohydrates). They’re bursting with those essential (meaning our bods can’t make them) omega-3 fatty acids, which combat inflammation, prevent disease, boost brain health, and give a nice sheen to your skin and hair. Spirulina: Say hello to nature’s multivitamin! Hi. Spirulina is a blue green algae that’s super high in protein, vitamin A, vitamin B12, and iron. One teaspoon has 2 grams of protein, 150% the daily value of vitamin B12, 30% the daily value of iron, and 190% of the daily value of vitamin K. It does smell a bit fishy, but you won’t taste it at all in your smoothie. One of Alchemy’s best selling smoothies is The Green Monster, which has a full teaspoon of spirulina! Nutrex Hawaiian spirulina is my go-to. 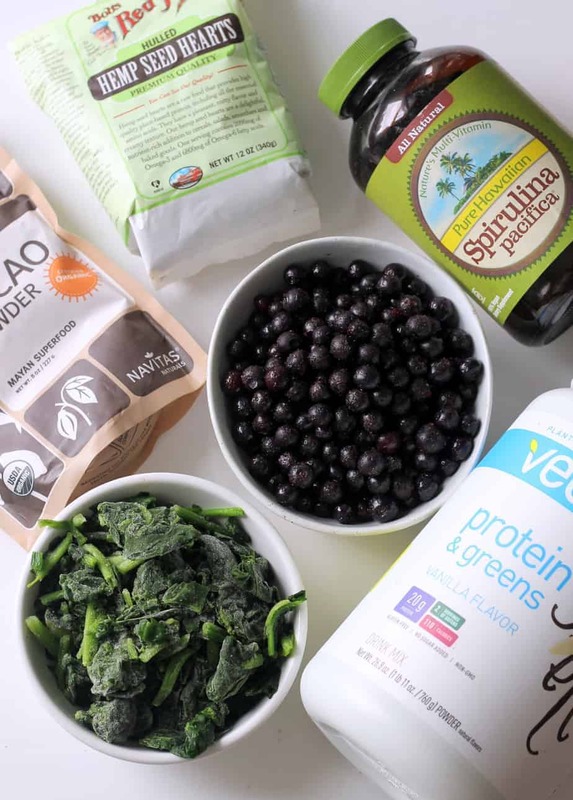 Plant Protein Powder: Adding protein puts some oomph in your smoothie step. It also adds sweetness (thanks to the stevia!) and awesome vanilla flavor. My go-to is Vega, but Skoop, is a close second. Stay away from soy protein isolate and any artificial colors or flavors. 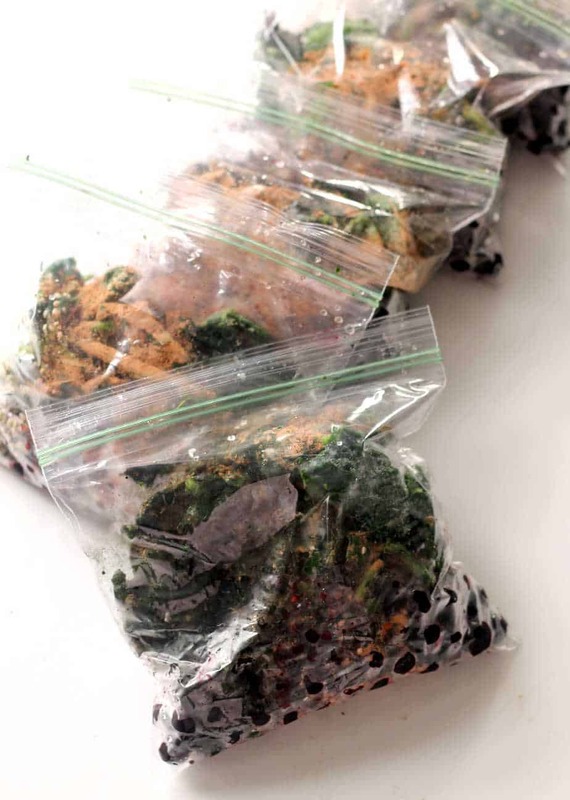 To make the smoothie bags, simply place all ingredients except liquid and any wet add-ins (ones that won’t blend well when frozen) in regular sandwich-size plastic baggies. I make 5 at a time. 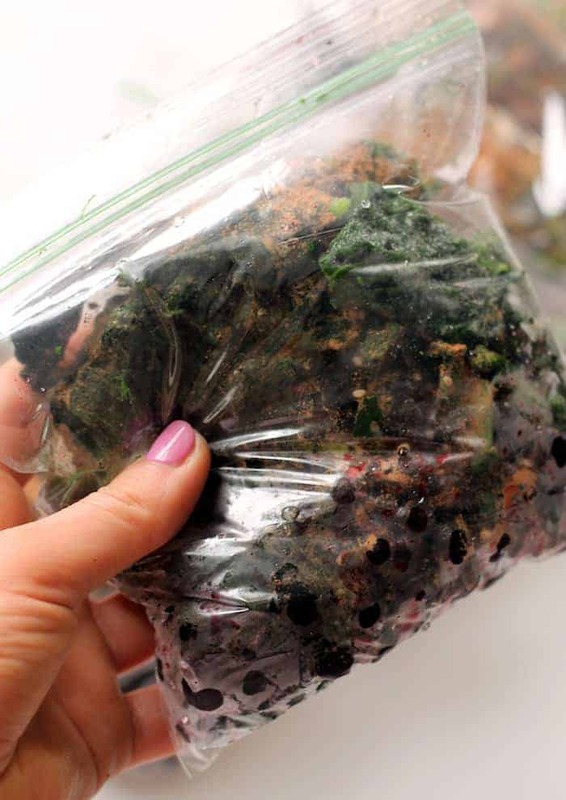 In the morning, dump baggie in blender, add liquid and blend! You can freeze your greens even if they’re fresh, but you may need more liquid. Oats, nuts, seeds, and protein powder are all fine to freeze. If you’re not using a sweetened protein powder like Vega, you’ll need additional sweetener for this recipe like a couple pitted dates or a splash of pure maple syrup. Add those in the morning. The blueberry cacao smoothie is my daily ritual, but feel free to try the other recipes below as well! I would also dd 1 cup of frozen spinach and about 3/4 scoop of Vega Vanilla Protein + Greens to these, both they’re both optional. You’ll also need about a cup and a half of liquid depending on if the greens are frozen. These make-ahead freezer smoothie packs make breakfast a breeze! First, get out 5 plastic baggies. Place blueberries in each bag, followed by the rest of the ingredients. 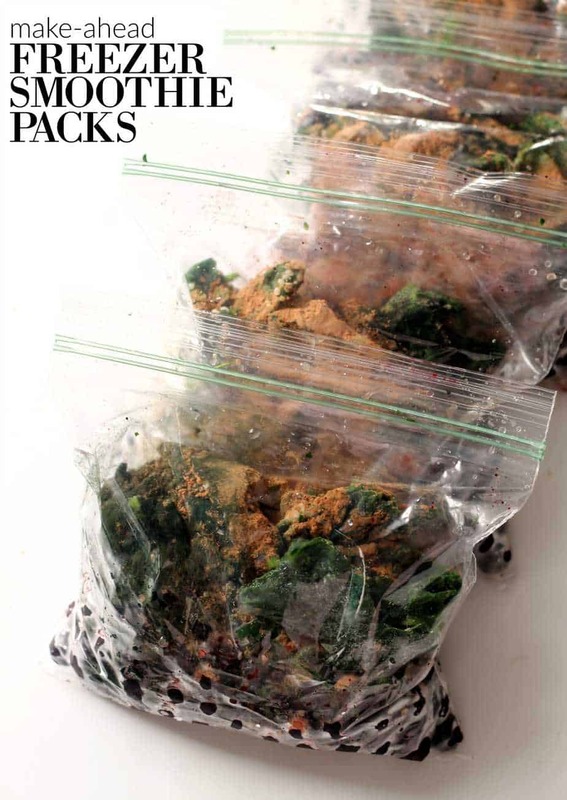 Place baggies in freezer. 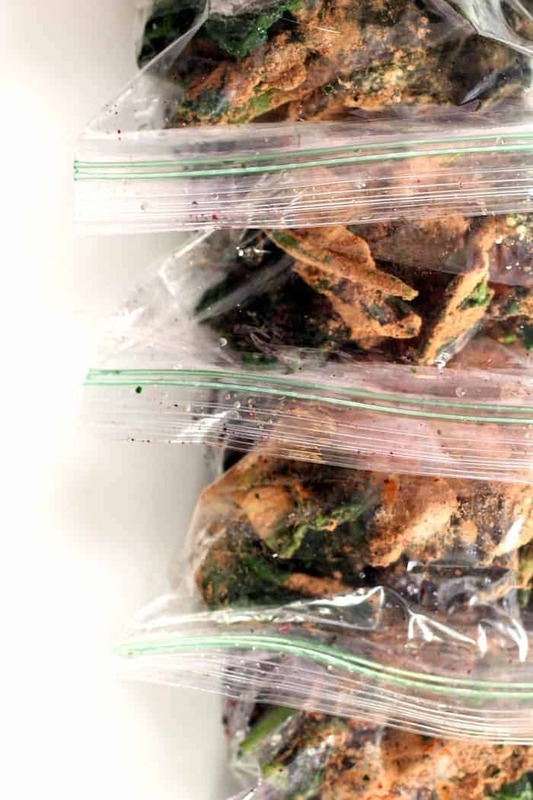 In the morning, dump the baggie in the blender with about 1 1/2 cups of liquid (almond milk, water, etc). To make more of a smoothie bowl, use closer to 1 1/4 cups liquid. Ohhh I really love this idea.. while I don’t meal prep nearly as much as I did when I worked in an office, I’m thinking I might start doing this for Miguel :D ..so he won’t be able to use the “I don’t have time” excuse. Pinning! Love this smoothie! I top mine with puffed quinoa and nibs. I also add some frozen sweet potato, strawberries and cherries, in place of some of the blueberries. Great way to use all the spinach I put in the freezer from my garden last summer. I’ve been adding a T of ground flax, but is hemp equally nutritious? It would be easier. Avocados actually do freeze really well! I just quarter them once ripe, take off the skin, and put them in ziplocks, and freeze. They blend into a perfectly creamy, decadent smoothie just as when fresh! I’ve always loved your smoothie bags! Fantastic idea. However, I’ve never understood why when I buy organic frozen spinach it says I need to cook it before using? It doesn’t make much sense to me — is it just a precaution? I always eyeball my smoothie ingredients when I put them in a blender. Even then I usually adjust as I go. Just the other day I was thinking how I’d like to have them portioned out ahead of time, but had no idea how much of everything to put in a baggie. I love that this recipe gives us the measurements! This is genius! I haven’t tried spirulina either. Next shopping trip! Smoothie bags are a fantastic idea. Just wondering if the spinach has to be frozen before adding it to the bags? I buy big containers of fresh spinach and was hoping I could just add some of it to each bag before freezing.